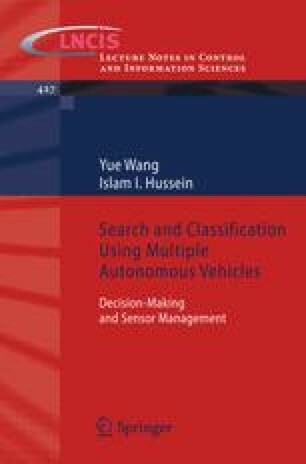 This chapter develops an optimal sensor management scheme for integrated detection and estimation under limited sensory resources in the presence of uncertainties. The objective is to effectively detect and satisfactorily estimate every unknown state of interest within a mission domain while minimizing the risk associated with the sensing allocation decisions. Section 6.1 reviews the literature on sensor management and summarizes the contribution of this work. Next, a brief review of the Bayesian sequential detection for discrete random variables is provided in Section 6.2. Its extension to Bayesian sequential estimation for continuous random variables is developed in Section 6.3. In Section 6.4, the Bayesian sequential detection and estimation methods are extended to multiple elements (cells for detection, process for estimation). A risk-based sensor management scheme for integrated detection and estimation of multiple elements is developed in Section 6.5. Measures of expected information gain for both detection and estimation are also discussed. The Rényi information divergence is introduced as a measure of the relative information loss, which is used to define the dynamic observation cost, in making a suboptimal sensor allocation decision. In Section 6.6, a numerical simulation is presented to confirm the effectiveness of the proposed sensor management scheme.